In the summer of 2011 my wife and I were doing pretty well with our store. We had rented the building and opened the store in December 2009. We rented out space much like a Vendors Mall, only it was much smaller and had a more personal touch that people really seemed to like. Our store did well enough to pay our bills and have some money to put back. That summer in April we decided to open another store and do the same thing! We found a building and started to work. This one was much larger and it took a lot of money, hard work and long hours to get it ready to open. Finally the big day! The store did as well as expected and was growing. We had all of our spaces rented but a couple and the Vendors were all happy with the sales the first month! Then two months into this project, disaster struck us! Without going into detail and taking a book full of pages to tell our story, we had a family related crisis that completely broke us! Not a penny left! I then hurt my back and could no longer work either store so we had to close both of them! Now all we could do was look like two deer caught in the headlights and wonder, why us? When we first opened the first store in 2009 I opened a Facebook account in my name and then one in the store name. Little did I know how much social media would play a part in us not losing everything we had ever worked for! I was constantly asking people who came into the store to join our Facebook group and it slowly grew and we had around 2,700 friends whe we had to close the store. Here we set! We started racking our brains, what was left of them. You see we didn’t have time to feel sorry for ourselves because everything we owned still had payments due on them. We had to figure out something and figure it out fast! I could not do heavy lifting of any kind or stand on concrete very long! The padding in between a couple of the disk in my back had deteriorated and the disk has dropped down on my Sciatic nerve and if I try to lift or pull anything with much weight I am down for a few days in pain! My doctor told me to not lift anything over 10 lb and to go sign up on disability. I have not signed up for disability yet. I hurt daily, but can still function as long as I don’t lift or pull! I have always been very independent and my wife has also. We have always felt we needed to make our own way and not be dependant on others! Boy, being broke is a bummer! We had to take some help from family members during this time and it will humble you! So here we were! Selling everything we could find on eBay worth a dollar or two just to keep food on the table and the lights on. Every payment we had was starting to get late. The banks started calling and we tried to explain, but what do you do? They want their money regardless! One day during this time my wife had stumbled across a place called Etsy. This is an online business where you can create an account and sell anything older than 20 yrs! We had lots of that kind of stuff. Back Roads Living was born! We also created a Facebook Page for Back Roads Living, little did we realize how much this social media would play in our lives and we started posting daily on it to promote our Etsy site. Back Roads Living was our seller name on Etsy! Between Etsy and eBay we were able to put food on the table and keep the lights on, but everything else was suffering terribly! The house payments were late, the truck payments were later, sheeeeewww, the stress was killing us! All we did was hunt stuff to sell on eBay and Etsy. Our whole lives revolved around this! One day, my beautiful smart wife says: Honey, I have been looking around on some of these Facebook sites and some of them have what is called a blog! What is a blog? I had never heard of one! Needless to say we read everything we could find and decided it was at least worth a try. Our biggest fear was that we would spend the money getting the blog set up and then spend months getting the money back, but we had to do something! I know $9.99 for the domain and $45.00 for the hosting doesn’t sound like much, but when you’re flat broke and needing money to pay the electric bill, it is a lot! We decided we would promote the blog on Facebook and use the same name! At that time we had around 1,200 likes on our Back Roads Living Facebook page. I knew nothing about WordPress or blogs or making money with blogs. I had never anything with the internet other than Facebook! What a ride! The days and nights flew by and we worked day in and day out on this. We rarely left the house for anything other than groceries and to pay a bill if we were lucky enough to have an extra dollar! On Jan 15th 2013 I downloaded WordPress and activated the Twenty Eleven theme and went to work! I made more mistakes than I care to talk about as I was totally ignorant to this blogging thing, child themes, CSS and yak, yak, yak! We were determined through! We kept working and got it done! We had a live blog on the internet with real posts, pictures and everything. My wife had been reading and she said lots and lots of new bloggers don’t make a $100.00 during their first year! WHAT?? We were determined to make this work. I started trying to make my posts more SEO friendly and still I’m in the dark about some of this stuff! If we had to depend on SEO and Google rankings for our revenue we would have lost everything! I was very fortunate to find Larry Deane (The owner of Side Income Blogging) during the first week we put our blog online. Larry helped me understand how to submit our sitemap to Google and recommended some great post to read! He has never failed to answer a question I ask him no matter how minor it may be…Good people are hard to find and I am thankful for Larry! My wife and I worked daily, sometimes posting as many as 50 pictures and updates a day on Facebook and promoting our blog. The number of Facebook likes began to increase along with the number of people visiting our blog. We applied for a Google Adsense account and were approved. It took me all day to figure out how to add advertising to our blog. I read everything I could find on Adsense and it just took a while to sink in. The information was there, I just didn’t understand all the terminology at first. I clearly remember our first click through from Adsense, it was exhilarating! We made less than a dollar that day and I know that doesn’t sound like much, but it was promising and it motivated us to work harder! We promoted all our blog posts on our Facebook page and by the end of the month we had earned a over $100.00. Our Facebook traffic continued to grow as well as our blog traffic. We were ecstatic! Facebook was making us money and it had the promise of paying some of our bills! These numbers grew as our Facebook account grew but during this time the numbers fluctuated drastically sometimes. There would be a day with 500 visits and then the next it would be 800 the next it would be 300, etc. I think if you have an established blog with very good with SEO and have high rankings on Google search, you can pretty much maintain your numbers from all I read. One of the things we didn’t understand was the power of a Facebook page with around 100,000 likes sharing one of your post. During the first three days of April 2013, our numbers tripled in both volume and income! We were elated and confused at the same time! Later in the month my wife finally figured out what had happened. Another Facebook user had found one of our facebook posts, liked what she saw, and shared it on her page which had 95,000 Likes! Wow, what a difference. A little later on I got the nerve to send her a carefully worded email that asked if she would like to share each others posts (not that she need our help) and I mentioned our blog in the email as well. She is a terrific lady! She not only said she would love to help out but also promoted three of our posts that day. We had over 10,000 visits to our blog that day! We had been averaging around 3,000 – 3,500 visits a day before this. Our income doubled for the next three days! We were elated. This is still a work in progress but I can see the potential of Facebook and social media playing a very large part in the future of blogging! 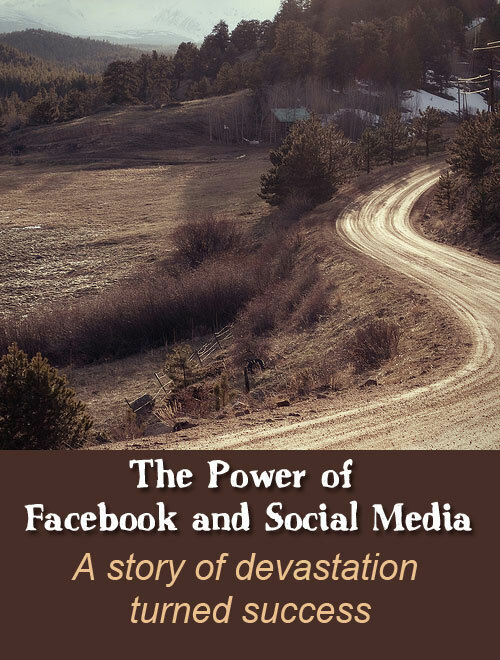 There is no way we could have kept our home, truck and many other possessions without Facebook and social media! If this trend continues we will be back on our feet and paying our bills on time in the next few months. That is our first goal! We just want to get the wolf off our back! As of this article, we have a Facebook, Twitter, and Google+ accounts! We get visits from all three, but Facebook is by far the one we get the most from. The others have potential, but we have to learn them and work them just like we did on Facebook before they will produce. First and foremost, if you have ambitions of creating a Facebook or other social media account and working with it to achieve lots of likes or followers so you can promote your Blog, please remember, your friends and followers have to be held up on a pedestal! They are your “Friends” and “Followers”, and have the potential to be a large source of your income…Treat them well! Growing your following is a very time consuming project if you do not already have a large facebook following. It can take months to get enough followers on Facebook to pay your bills or make a living. I still think it is very important to obtain knowledge of good SEO practices and how to rank high in the Google searches. We never know what tomorrow holds! Facebook and social media are great and so is Google Adsense but they could change tomorrow! You just never know. My thanks to Larry Deane for asking me to share my story in hopes that it may help someone else along their path! If one person can benefit and make their life better from this post then my objective has been met! Money means a lot and we have to have it in life to get by, but our families, friends and fellow man should never come in second place to our success. They should all be shared equally! I am a firm believer that what you earn is yours to do with as you please. But…What you do with this money defines your character! We do not feel like we have been treated unfairly or unjust by our Creator! Things could have been much worse and I believe that there is a reason why things come about in our lives. Our tragedies can and will turn into blessings if we just trust that God knows best! Our hope is that maybe some of you out there who need to make fast changes can benefit from this post. Good luck in your adventures and may you be ~Blessed~ Matthew 6: 25 – 29 – If God so clothes the Sparrow! Charles and his wife blog at Back Roads Living about country living and share all of the things they find and encounter while traveling the back roads.